I know it is only mid November but planning Christmas dinner that early is super duper important for me. It helps me go through the holiday without too much stress. I can even save money by doing this as I will watch out for deals and coupons for the ingredients I need. It’s a win-win stituation. Besides I get to test try the recipe before serving it. Many people prefer cooking Turkey for Christmas. Since I went with that option for Thanksgiving, I decided to go with Ham. Now let’s stop the talking and get this Christmas dinner recipe: a delicious Honey Glazed Ham. Do you plan your Christmas dinner ahead of time or are you a last minute person? Tell me. Preheat oven to 325 degrees. Prep roasting pan with Pam Spray. Put the ham in the roasting pan. Combine brown sugar, pineapple juice, honey, orange juice, and ground cloves. Stir well. Put the ingredients in a sauce pan. Place the saucepan on the stove top bringing them to a boil. After bringing to a boil reduce the heat. Simmer for 5 to 10 minutes. Set aside. Bake ham at 345 degrees uncovered for 2 hours. Take the ham out of the oven. Set aside. Brush the ham with glaze. Bake at 325 degrees for an additional 30 to 45 minutes. Brush the ham with glaze every 10 minutes. 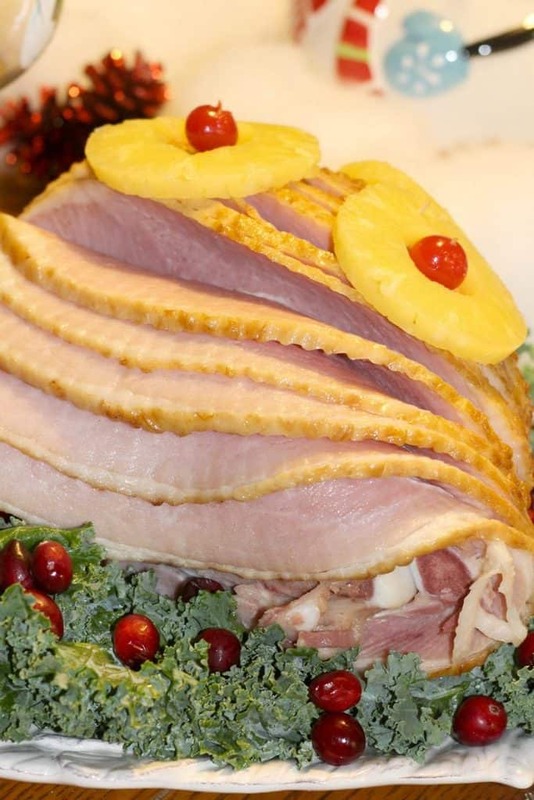 After applying the last glaze place the pineapple rings and cherries on to the ham with wooden toothpicks. Remove from the oven, allowing the ham to cool briefly. I love a good ham for Christmas dinner! 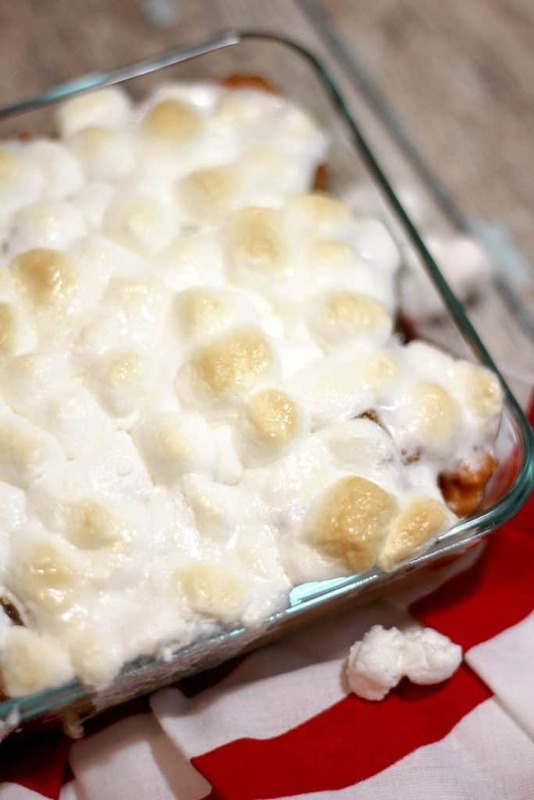 This one looks so good, thank you for sharing the recipe! 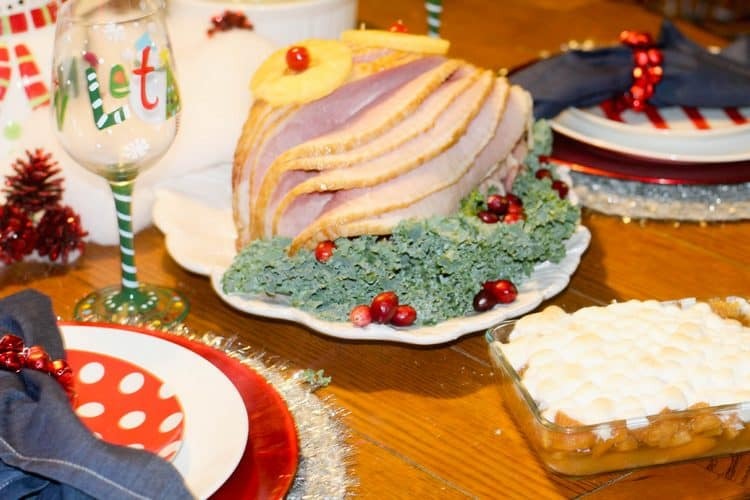 I am doing a ham this year for Christmas and I was wondering what recipe I will try out and I really like your awesome recipe and will be making it this year. Thanks for sharing. Yum yum! We were thinking of having Ham for Christmas and now I really want to. I have yet to make a ham like this before! Looks like a great centerpiece for the holiday! This looks so delicious and makes me wish Christmas was already here! This ham looks so good! I love it cooked with pineapple. It’s always so juicy! YUM! I cant wait to make the Christmas ham! So so yummy! Its the only time I really eat ham! I love ham but nobody in my family enjoys it as much as me. I make it once in awhile but have to be prepared to eat the whole thing myself. We enjoy ham as well. Plus, I love all of the sandwiches for the week following. I always prefer ham over turkey even on Thanksgiving. That looks super tasty! Omg! What a yummy ham. Ham is such a great dinner to have during the holidays. Always a hit! When I pull out a honey glazed ham it makes my family very, very happy. The ham makes the meal. I am definitely a planner!! I love the glaze for this ham and I bet it just melted in your mouth!! I always make ham for Christmas dinner. I love how amazing this ham looks. I will have to try this recipe this year. 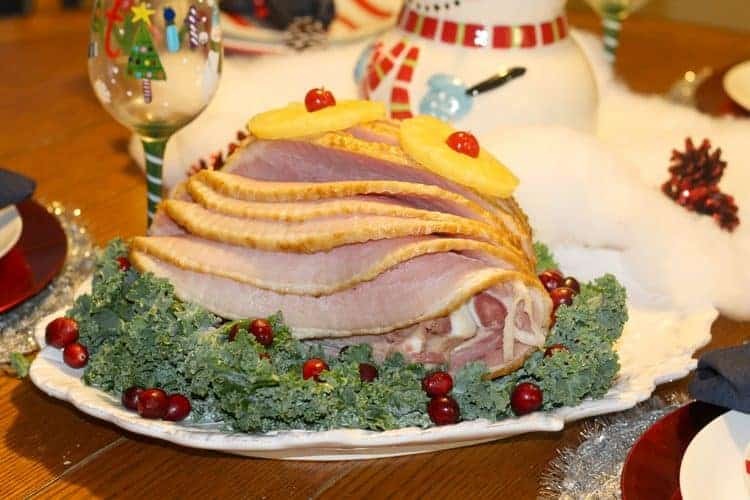 This is the exact recipe my grandpa would use to make our Christmas ham growing up. It is the best way to eat ham the night of and for the next week in sandwiches and ham soup! This ham looks delicious! We always do a ham at Christmas. I will have to try your recipe. Thanks! The ham looks delicious. I could use this recipe for our upcoming Christmas dinner at home. Thanks! I am making a little ham this year. There’s only 3 of us so I am not going to spend all day attempting turkey. I had no idea what I was looking for today though… I had to ask someone at the store how I even made the ham. Lol! Mmm. My family could go for some of this for sure! I love how you presented it too! This looks like an amazing ham and I don’t even like ham. LOL!! Great recipe!! We usually do the same thing each year. So we have it all planned out already. This year will be a ham since thanksgiving we had turkey. That sounds so good. We actually make a ham on Thanksgiving, too, because there are a few people that don’t like turkey! Growing up we always had ham for the holidays. Like you it was honey glazed with pineapple; I’ve never made one myself I might give it a try. This looks so yummy and now I can’t wait for Christmas. Yay, ham, lol! I’m a fan of ham for thanksgiving & Christmas. Maybe it’s because I’m a KY girl or something, but I just have never liked turkey much at all. But I love ham! Looks very delicious. Love having family over for Christmas dinner. Your ham looks so delicious, I’ve seen the pineapple slices added, but not the cherries, they’re a nice touch. Taxing Sweets: A Good Way To Prevent Childhood Obesity Or Overstepping Bounds?